An obstetric nurse and community health educator for over 20 years before becoming an avid student of the neuroscience of humor and laughter, Deb has particular expertise in the way gratitude and appreciation impact workplace and personal well-being. She is passionate about helping women build self-compassion and recognize their own beauty. 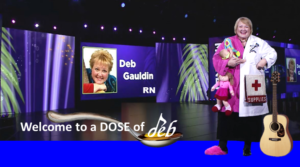 Deb’s products and music are used in nursing education settings around the globe. 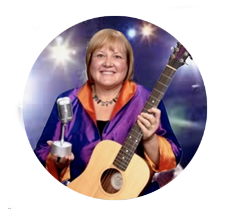 She is a contributing author to numerous books and has written and illustrated humor columns for a variety of professional journals. Completing a 3-year graduate level accredited course and practicum through the Association for Applied and Therapeutic Humor (AATH), Deb graduated with the first ever class of Certified Humor Professionals(CHP).AATH Certified Humor Professionals. Of her many professional awards and affiliations, Deb insists her best credential are her stretchmarks and laughlines! Deb grew up in Iowa and except for the year she planned to be the reigning Miss America, or more likely the Iowa Pork Queen, she wanted to be “The Singing Nun”. Not being Catholic was just one of the obstacles!